Over the weekend, the Varsity boys competed well in Allen’s annual soccer tournament against some of the state’s best talent. 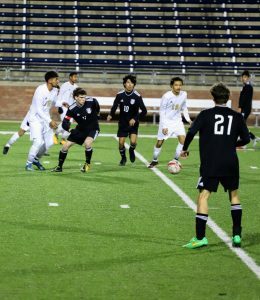 On Thursday night, at Eagle Stadium our boys were able to work through a tough Dallas Conrad team, winning the match 4-2. While the score would indicate the Leopards were able to coast to a reasonably easy win, the game was a great test for the team, as the Leopards jumped out to a early 2-0 lead, only to see the lead vanish within 10 minutes in the 2nd half. Tied 2-2, the boys were able to compose themselves, and tack on 2 more late goals to walk away with a well earned 4-2 win. 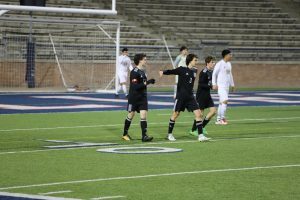 On Friday in the rain, the men were challenged with a very tough, playoff tested Hebron side that was able to use an early set piece to tally the match’s only goal. While opportunities were had by the Leopards most of the night, the Hawks were able to make the 1 goal stand, and moved to a 1-0 win. Saturday saw much drier conditions, but brought the cold and wind into play. The boys were able to use Max Pabin’s 1st goal of the season assisted by Benji Merrick to grind a victory out, defeating a very talented Plano Eat squad. The men will be back in action in Forney this weekend, after a couple practices this week.